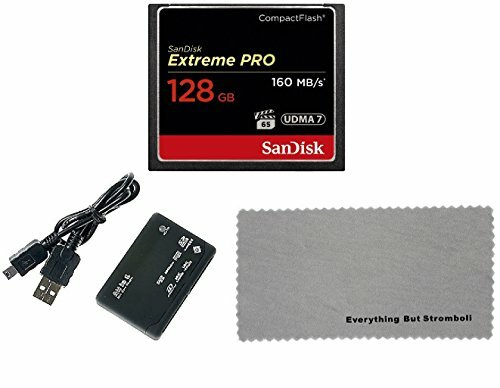 This bundle includes a SanDisk Extreme Pro 128GB CompactFlash Memory Card, an Everything But Stromboli MicroFiber Cloth and All-in-One Combo card reader (Color May Vary) Designed to meet the rigorous requirements of professional photographers and videographers, the SanDisk Extreme PRO CompactFlash Card delivers the sustained write speeds to capture cinema-quality 4K Ultra HD and Full HD video. From a global leader in flash memory storage solutions, this card also features Video Performance Guarantee-65 (VPG-65), which ensures smooth video capture. Additionally, write speeds of up to 150MB/s allow photographers to shoot in continuous burst-mode, capturing multiple frames per second without lag time and a storage capacity of 128GB means professionals can keep shooting videos and photos without stopping to change cards. SanDisk products are constructed to the highest standards and rigorously tested. You can be confident in the outstanding quality, performance and reliability of every SanDisk product.